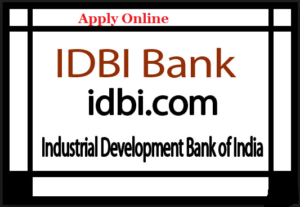 IDBI Latest Recruitment 2019 Apply Online Check IDBI Bank Executive Notification 2019. Industrial Development Bank of India Latest Jobs released now online. Get ready for another recruitment opportunity with Industrial Development Bank of India. In the latest IDBI Recruitment 2019, there are Executive Jobs this year. The final date for online application updated soon. Keep reading further to get the more details related to the IDBI Recruitment 2019 Notification For Executive Posts. This Bank Limited is a Universal Bank having an efficient workflow through the Latest IT sources and platform. The banking firm focuses on providing valuable customers through personalized banking and financial solutions worldwide. The Bank has a wide coverage of Indian Private, Personal, and Corporate Sector. With a large network of ATMs support to the users, the organization has gained much growth and trust among the customers. The organization, apart from serving the users, also hands the opportunity of Bank Jobs to the many candidates. Recently, in a Notification, there are various vacant positions that are disclosed and the Recruitment process is to be conducted nationwide. Here are the job-related updates for our aspirants. According to the IDBI Recruitment Notification, there will be the process of online Application Form filling only. The final day for online registration for IDBI Recruitment 2019 is updated soon. The final date to submit the application fee along with the last date of submission is updated soon. Know more about the job details like Eligibility and educational requirements in the following sections of this page. Education Required: Minimum education required for Executives’ Posts is Graduation/Degree in any discipline from a recognized University. The minimum percentage required is 60%. Age Limit: As on October, aspired candidates must be between the age group of 20-25 years. For candidates belonging to the General Category must pay Rs. 700/-, while for reserved categories like SC/ST/PWD it is Rs. 150/-. Online Banking, Credit/Debit Card (Rupay/Visa/MasterCard/Maestro), Debit, IMPS, Cash Cards/Mobile Wallet. Applicants will be screened through Online Exam, Interview, and a Medical Exam. Selected employees will get Rs. 17000/- as the monthly payment for their services. The period of the contract for the Executive posts is 01 year but it can be extended up to 03 years. After completing the 03 years service, the aspirants may become eligible for appointment as Assistant Manager Grade A in the Bank. Reach the Authorized web portal for the Bank. On the homepage, find the career tab and follow a proper link that displays IDBI Recruitment Notification for Executives Posts. Download the Advertisement (Link given below) and read the notice carefully. Start applying for the jobs and duly fill the application form. Upload the necessary documents and provide your true details. Pay the fee amount as per your category. Verify your details once again before submitting your information. Finally, get a copy of this application form printed and keep it safe for future requirement. This is an Indian government-owned financial service company especially known as Industrial Development Banking of India. The headquarter is located in Mumbai, lots of candidates want to work in this sector and make their future and careers bright. Currently, IDBI Bank applications form issued for all the qualified & talented aspirants for those who desire to work in Executive vacancies. Still, a candidate has to wait a little while for more detail like notification, vacancy detail, the total number of vacancies. Get the Recruitment Notice here.